This is a full 3-hour event, free of charge, with a lot of fun activities planned for you and your child and it will be held at Magical Bridge Playground in Palo Alto. Your chance to meet and connect with families and professionals who are there to provide you with guidance, answers and support! You are not alone! It takes a village to raise a child, it takes community to make a difference and pave the way for our kids. Join our special needs community and help me pave the way for the future! 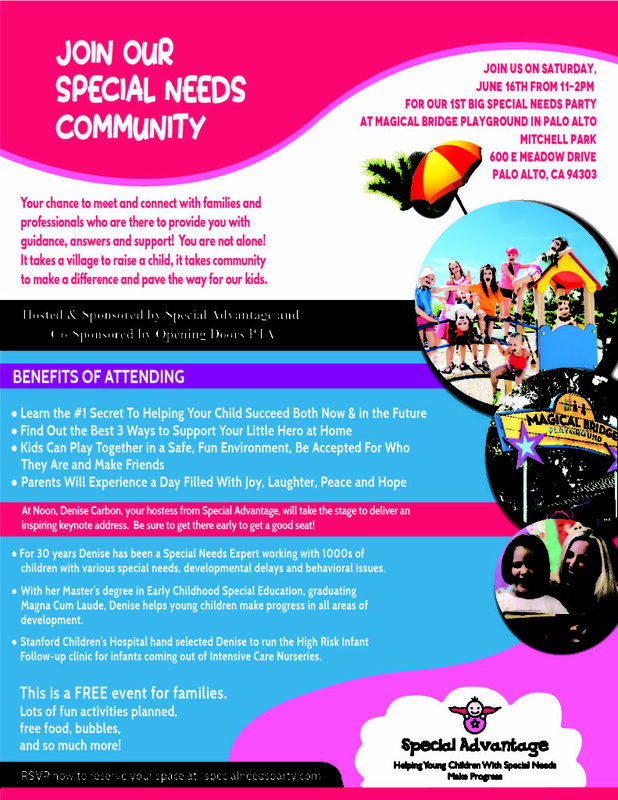 It doesn’t matter if your child has a diagnosis or not, a developmental delay of some sort, a special need, or if you’re just worried about their development in some area and don’t feel you identify with “special needs” at all… I hope you come be part of this special community celebration to honor the children (and their families) who need a little extra special support. I’m Denise Carbon, a Special Needs Expert for 30 years, and I’m hosting and sponsoring this magical event. I help young children with special needs (birth to 5) make progress and help their parents get out of fear and uncertainty about the future. I understand that parents worry their child won’t catch up, will be bullied in school, and might not make friends and that all they really want is to know they are doing the right things to help their child catch up, so they will grow up and live a happy, independent life. It’s my desire to bring families together, in community, for support, connection, education and empowerment. At 12pm, just before lunch, I’ll be delivering a 30-minute instructional keynote. I’ll share the top 3 things you can do as a parent right now, at home, to support your child and help them make progress! You won’t want to miss it. Plan to be there for the full 3-hour event – it’s gonna be a lot of fun as well as educational! Our HUGE bubble party will start at 11am so plan to be there at that time for kick off. Again, this is a FREE event for families. Lots of fun activities planned, free food, bubbles, and so much more! If your child requires any special food, snacks, or sunscreen… kindly bring it with you so we know they’ll be happy throughout the day. I SO look forward to seeing you there and can’t wait to connect, meet your child(ren) and hear your story! See attached flyer for more info AND be sure to print it using “SHRINK TO FIT” so you get all the necessary information to attend. Kindly RSVP at: specialneedsparty.com so we know to expect you. This event is Hosted & Sponsored by Special Advantage – Helping Young Children With Special Needs Make Progress – and Co-Sponsored by Opening Doors PTA. This entry was posted	on Wednesday, June 6th, 2018 at 9:59 am	and is filed under Blog, Events, Inspirational. You can follow any responses to this entry through the RSS 2.0 feed. Both comments and pings are currently closed.